This was the question posed to me by a clear but disembodied voice disturbing my reverie as I sat privately in my stall in the men’s room. Well, other than it’s none of your business, nature would be my first response. And it’s not really unexpected: it happens regularly all the time. But before I could answer, I got another intriguing question. Now things were getting a little strange. I wanted to point our that prolonging my stay was not in my, or other people’s, best interest. I also wanted to stress that I did not extend my bathroom breaks as excuses to finish the New York Times crossword puzzle, for example. Once again, before I could respond, the disembodied voice queried me once more. The man in the stall next to me was a businessman who saw no reason to interrupt his business call with a bathroom break. Ah, the modern inconvenience of the cell phone. I’m uncertain what the individual at the other end of the call thought about the background sounds during this conversation but I, for one, am not keen on mixing business calls with nature’s call. This entry was posted in Humbug! and tagged annoying people, complaints, conferences, conversation, etiquette, humor, humour, musings, nature's call, restrooms, smartphones. Bookmark the permalink. Thanks for visiting and wiping your feet. I guess some people don’t understand that ‘when nature calls’ it is just a figure of speech. I agree. When natures calls, it is best not to answer. One of those wonderful posts that have a “Yuk” factor in both senses of the word. I’m of the the same outlook as Kami. On those occasions when somebody is in there on the phone, I also try to liven up the ambiance. Hear, hear! Or should I say Pffft, pffft!? Eeuw. (But I’m laughing at your conference call scenario even though it’s a little too close to reality.) People just have no grasp of reality or propriety. At my gym there are big signs forbidding the use of phones or mobile devices in the change rooms… which naturally doesn’t stop people from using them anyway. One day when I was changing, a woman whipped out her laptop, with the webcam facing me, and started checking her schedule. When I reminded her about the rule and the fact that webcams can be remotely activated without her knowledge, she gave me a look as though I’d just stuck my finger up my nose. 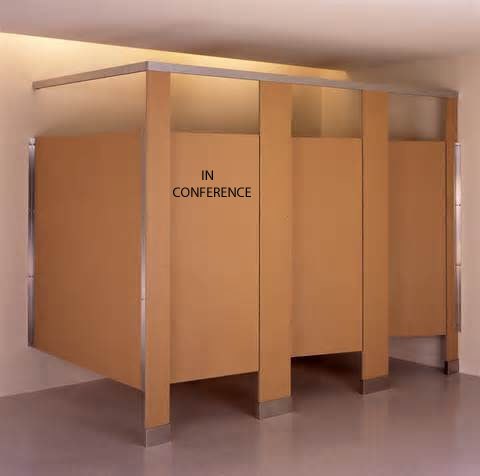 I had not even thought of the possibility of a restroom teleconference! Oh, yuk! Some people operate on the principle that if it doesn’t offend them, it doesn’t offend you. Even though I checked “like’ this post is not really one having images that I can like. In fact, Yuk! Yes, you are not the only one who has told me that my posts have a high yuk factor. Every time I hear someone talking on their phone in a public restroom, I make sure to repeatedly make loud annoying noises and flush the toilet. This is definitely one of my biggest pet peeves! If only ‘loud annoying noises’ would stop these people. I’m always appalled when I see people in public washrooms using their phones. Surely the person on the other end can hear the ‘background noises’ – how rude! I certainly hope the person on the other end hears those background noises and hangs up. Very funny post. Thank you. I don’t understand what possesses people to talk while they piddle–whether they’re talking on the phone or just in general. Some acts are meant to be private! Unless there is a life changing event – a birth or death – I can’t see a reason for a conversation in a restroom.